From 240 Euro per person If you are short on time, our Cappadocia Day Trip From Istanbul / Cappadocia Day Tour From Istanbul By Domestic Flight is the perfect solution for you! You'll get picked up from your Istanbul hotel and then fly to Cappadocia, exploring Cappadocia's highlights before flying back to Istanbul in the evening. It's an early start this morning when you are picked up at approximately 03:40 (depending on the location of your hotel) from your hotel for your flight from Istanbul to Kayseri. The flight from Istanbul to Kayseri takes just over 1 hour. Upon arrival in Kayseri Airport we will welcome you and transfer you to Cappadocia for your Cappadocia Day Tour. 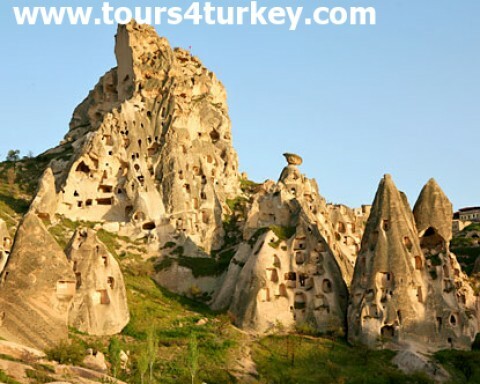 Your Cappadocia guided tour covers Goreme Open Air Museum, Rock Churches, Uchisar Castle, Cavusin Old Greek Village, Pasabagı Fairy Chimney, Avanos Pottery Demonstration, Devrent Imagination valley and Cappadocia Wine Tasting. After the tour we will arrange for your transfer to Kayseri airport from Cappadocia. You will arrive in Istanbul after a 1-hour flight. Upon arrival in Istanbul airport we will greet you and drive you to your hotel.